New Delhi, India, 9 October 2018 - SHRM India is organizing its 7th SHRM India Annual Conference & Exposition 2018, on 11-12 October, 2018, at Hotel Taj Palace, New Delhi. 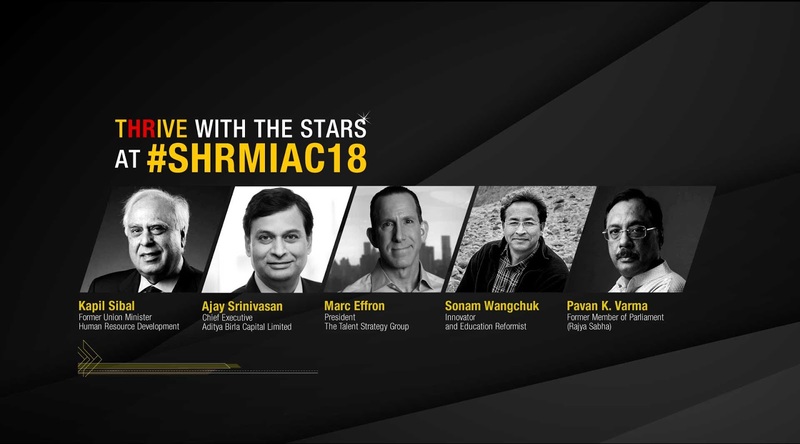 The most premium HR event in the subcontinent, SHRMIAC18 will offer the biggest opportunity for HR professionals to learn, share and reinvent themselves in people management. The HR industry is currently in its prime, bursting with a multitude of innovations and opportunities. Over the years, SHRMIAC has become a crucible for learning, sharing and creating new path breaking associations in the world of People Management. It provides HR professionals and their organizations with opportunities to evolve, grow and flourish to their truest potential. SHRM’s passion is to create the right environment for you to realize your dreams and interact with thought leaders from around the globe - to help you and your organization THRIVE. Some of the esteemed speakers for the conference this year are Kapil Sibal, former Union minister, HRD; Marc Effron, President, The Talent Strategy group; Ajay Srinivasan, Chief Executive, Aditya Birla Capital Ltd; Sonam Wangchuk, Innovator & Education Reformist;Coretha M Rushing, SHRM-SCP, Board Chair, SHRM; Raj Raghavan Senior VP- HR, Indigo; Shoma Chaudhury, Co-Founder & Director, Algebra, the Arts and Ideas: Pavan K. Varma, Former Member of Parliament (Rajya Sabha); Arjuna Sirinanda, Managing Director Fortude (Brandix Company); Abhijit Bhaduri, Author Columnist & Management Consultant; Rajan Kalia, Co-Founder, Salto Dee Fe Consulting; Ranjan Mohapatra, Director (HR), IndianOil; Rohit Thakur, Head of HR, India at Accenture; to name a few. Speaking about the conference, Ms Achal Khanna, CEO - SHRM India and Business head, APAC & MENA, said, “With a paradigm shift in the role of human resources, HR professionals need to continuously do a fine balancing act by catering to the organization’s needs and developments as well individual aspirations. The need for a modern and effective role for HR cannot be undervalued within an organization. Organizations which have understood the changing role of HR in the changed scenario will certainly thrive against all challenges. We are once again extremely delighted to host our seventh Annual conference, one of the best learning and networking platforms for leaders who want to thrive in future workplace. This conference will set the stage for the delegates to meet the eminent HR experts and know their insights in the best practices”. The two-day event will set the platform for the delegates to get fresh perspectives from Business and HR leaders from across the world through highly engaging knowledge sessions, panel discussions and keynote addresses. The conference will see active participation of over 1500 delegates from more than 600 organizations, 50+ knowledge sessions, 100+ global speakers and 100+ exhibitors and partners. Siddharth Reddy, MD, BI WORLDWIDE India, Said, “HR industry is thriving on massive transformation owing to technology infused disruptions, process automations and robotics. Organisations are trying to decipher various strategies to not only attract the right talent and skills but also to retain them for longer association in this fiercely changing talent market. In such times, defining an EVP (employee value proposition) strategy around why would a talented employee choose to work and stay with your organisation is an inspiring approach to attract, engage and retain the best talent. BI WORLDWIDE, global leader and India’s foremost in employee engagement solutions inspired by applied behavioural sciences and a strategic partner to SHRM, brings to you a research based and proven EVP framework to design, develop and activate your overall EVP strategy at the SHRM India Annual Conference & Exposition 2018. Like every year, SHRM India will recognize and felicitate best practices, path breaking innovations, game changing strategies in HR through the “SHRM HR Excellence Awards 2018”. Last year, the conference was an overwhelming success 80+ world class speakers sharing their experience and expertise in 35+ knowledge and industry specific vibrating sessions. Over 1350 delegates and more than 550 organizations attended the conference.